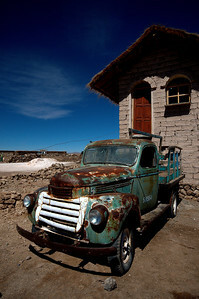 Our tour of southwestern Bolivia with Ripley's Tours began 2 hours late. We sat outside the tour office watching other groups meet their sharply-dressed guides,load up their 4x4's and depart. This gave us the time to meet our travelmates, an adventurous French trio: Jonas, Jonathan and Mathilde and a solo Israeli Michael. Michael had enough supplies to last a month in the desert, including a 2kg bag of animal crackers and an enormous backpack. It was pretty obvious that the promise of a 10a.m. departure, a guarantee of fuel (despite the region-wide shortage), an English speaking guide and a new jeep was not going to be fulfilled. When the jeep finally pulled up there was now a significant doubt as to whether it would be able to actually complete the trip. It was in pretty rough shape and we consoled each other by attempting to remember ones we'd seen that might have been worse looking. Our driver Hilarion, a huge local clad in oil stained sweat pants (having probably spent the morning getting the jeep to start) was not particularly amused by the situation. 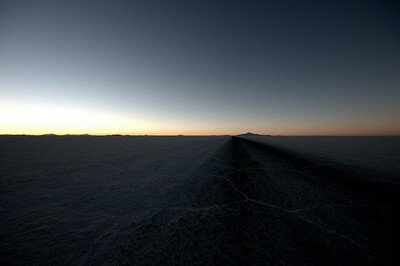 We strapped our bags and boxes of food along with the fuel on the roof and pulled away towards the salt flats. Our first stop was the train cemetery, which luckily Yann and I had already visited. Due to our late departure, we spent about 10 minutes there. To our surprise, we then drove back to Uyuni, where our driver proceeded to drive through the back streets stopping at make-shift garages inquiring about spare tires (apparently we didn't have one yet). We eventually found one, that actually looked in worse shape than our jeep. We also picked up Hilarion's cousin Maria (our cook) and, another surprise, her 1-year old son Jesus. The nine of us headed off back towards the desert. 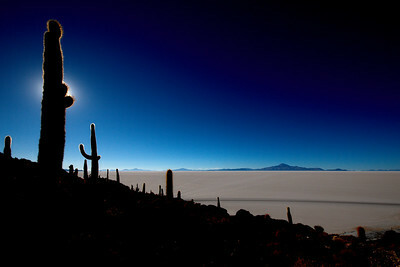 The Salar de Uyuni is the largest salt flat in the world (10500 square km) and a highlight of the southwestern circuit, it begins about 10km from Uyuni. The first part of our salt flats visit was the 'Salt Museum' in Colchani, also known as the row of vendors selling knick-knacks made out of salt. 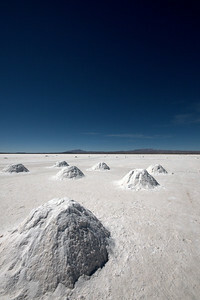 The villagers living on the outskirts of the salt flats make their living from salt harvesting and processing and supplement their meager wages by selling their salt figurines to tourists. We felt torn between buying an item from a poor villager and the fact that the items were useless and overpriced. In the end, we left empty handed, hoping that other tourists might have a need for a salt ashtray. (Note: A few hours later I bought a pill box made from salt, which Yann proceeded to misplace on the salt flats 5 minutes later, we never found it). We drove a few kilometers from Colchani where we saw the villagers mining the salt. 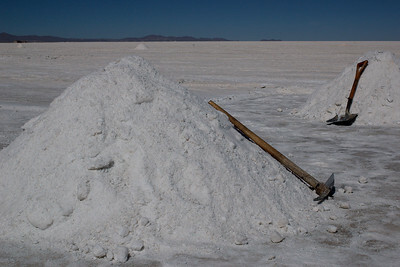 After being scraped from the surface of the desert with a pick axe, the salt is then placed into large piles to eventually be loaded into rusty trucks and carried off to refineries. After a brief stop photographing the salt mounds, we moved on to another great addition to the salar brought by tourism: the Salt Hotel. Structures like this one are now illegal to build on the salt flats, but this one was permitted to stay. The ugly building made entirely of salt is now where most of the tour groups stop for lunch. We reached the hotel as most of the other groups were eating, our late departure from Uyuni had at least kept us from traveling in the jeep convoy. 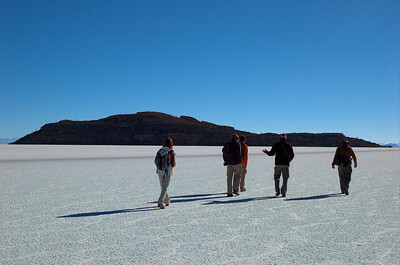 While lunch was being prepared we had the chance to walk around and admire the blinding white salt flats that stretching out for kilometers in every direction. After the rainy season, the salt dries up and crystallizes into hexagonal formations, covering the entire surface of the desert. It was after lunch that our car troubles began. As we drove along to our next destination along the hard, flat salt, we popped a rear tire and began swerving out of control. The advantage of having a jeep in such a sorry state, was that we hadn't be traveling very quickly and our visibly shaken Hilarion was able to come to a stop without flipping. After only a few hours on our trip, we had already lost a tire, and we hadn't even began any of the rockier terrain. Plus, we had the world's worst spare tire to drive on for the next 3 days. The island that we were to visit was visible in the distance so we decided that we would leave Hilarion to unload the jeep and put on the spare tire while we made our way to our next stop. Distances can be quite deceiving in the desert, but we made it to the island in 30 minutes or so, with our pathetic jeep becoming a smaller and smaller sight in the distance. We were again one of the last groups to arrive at Isla Incahuasi, a small oasis home to a colony of gigantic cacti. We had lots of time to explore it and as all the other groups departed we watched the sun get lower and lower in the sky. After our lengthy visit and at least an hour of waiting around the jeep (that had finally arrived to meet us), there was still no sign of our driver. I tracked him down to the small tourist office on the island, where he was desperately trying to radio back to his office in Uyuni. It turned out there there might be more problems with the jeep than the spare tire. He explained that he would drop us off at our lodge and drive back to Uyuni to replace the jeep. We still had a significant distance to complete and by now the sun was setting. We were now half-jokingly discussing the possibility of spending the night on the salt flats at -20 C. We were greatly relieved to spot the tourist lodges lined up on the outskirts of the desert. But when we pulled up, we were told there was no room for us. (What? No reservation?) We ended up in a small village further on, that had a lovely room for us in their salt hotel (complete with the hottest shower I had in Bolivia?!). We said goodbye to poor Hilarion who drove away in the darkness, back to Uyuni to get us a replacement jeep. So, does he hate you? I can't believe you walked across the salt flats.Did you see buzzards circling above?